This article was written by Jordan Raine from the University of Sussex, and was originally published by The Conversation. Laughter plays a crucial role in every culture across the world. But it’s not clear why laughter exists. While it is evidently an inherently social phenomenon – people are up to 30 times more likely to laugh in a group than when alone – laughter’s function as a form of communication remains mysterious. A new study published in the Proceedings of the National Academy of Sciences, and involving a large group of researchers led by Gregory Bryant from UCLA, suggests that laughter may indicate to listeners the friendship status of those laughing. The researchers asked listeners to judge the friendship status of pairs of strangers and friends based on short snippets of their simultaneous laughter. Drawn from 24 different societies, they found that listeners were able to reliably distinguish friends from strangers, based on specific acoustic characteristics of the laughter. In order to unravel how this is possible and what the true meaning of laughter is, we need to delve back into its early origins. Spontaneous laughter, which is unintentionally triggered by conversation or events, emerges in the first few months of life, even in children who are deaf or blind. Laughter not only transcends human cultural boundaries, but species boundaries, too: it is present in a similar form in other great apes. In fact, the evolutionary origins of human laughter can be traced back to between 10 and 16m years ago. While laughter has been linked to higher pain tolerance and the signalling of social status, its principal function appears to be creating and deepening social bonds. As our ancestors began to live in larger and more complex social structures, the quality of relationships became crucial to survival. The process of evolution would have favoured the development of cognitive strategies that helped form and sustain these cooperative alliances. Laughter probably evolved from laboured breathing during play such as tickling, which encourage cooperative and competitive behaviour in young mammals. This expression of the shared arousal experienced through play may have been effective in strengthening positive bonds, and laughter has indeed been shown to prolong the length of play behaviours in both children and chimpanzees, and to directly elicit both conscious and unconscious positive emotional responses in human listeners. The emergence of laughter and other primal vocalisations was at first intimately tied to how we felt: we only laughed when aroused in a positive way, just as we cried only when distressed, or roared only when angry. The key development came with the ability to vocalise voluntarily, without necessarily experiencing some underlying pain, rage, or positive emotion. This increased vocal control, made possible as our brains grew more complex, was ultimately vital in the development of language. But it also allowed us to consciously mimic laughter (and other vocalisations), providing a deceptive tool to artificially quicken and expand social bonds – and so increase survival odds. The idea that this volitional laughter also has an evolutionary origin is reinforced by the presence of similar behaviour in adult chimpanzees, who produce laugh imitations in response to the spontaneous laughter of others. The fake laughter of both chimpanzees and humans develops during childhood, is acoustically distinct from its spontaneous counterpart, and serves the same social bonding function. Today, both spontaneous and volitional laughter are prevalent in almost every aspect of human life, whether sharing a joke with a mate or during polite chitchat with a colleague. However, they’re not equivalent in the ear of beholder. Spontaneous laughter is characterised by higher pitch (indicative of genuine arousal), shorter duration and shorter laugh bursts compared to volitional laughter. Researchers recently demonstrated that human listeners can distinguish between these two laugh types. Fascinatingly, they also showed that if you slow down and adjust the pitch of volitional laughter (to make it less recognisable as human) listeners can distinguish it from animal vocalisations, whereas they cannot do the same for spontaneous laughter, whose acoustic structure is far more similar to nonhuman primate equivalents. It’s this audible difference that is demonstrated in the paper by Bryant and his colleagues. 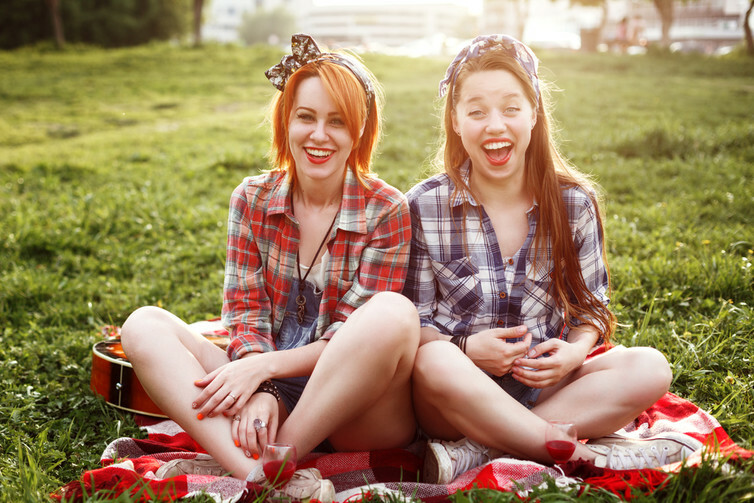 Friends are more likely to produce spontaneous laughs, while strangers who lack an established emotional connection are more likely to produce volitional laughter. The fact that we can accurately perceive these distinctions means that laughter is to some extent an honest signal. In the neverending evolutionary arms race, adaptive strategies for deception tend to co-evolve with strategies to detect that deception. The acoustic characteristics of authentic laughter are therefore useful cues to the bonds between and status of members of a group. This is something that may have aided decision-making in our evolutionary past. However, the study found that judgement accuracy was on average only 11 percent higher than chance. Perhaps this is partially because some strangers may have produced spontaneous laughs and some friends volitional laughs, but it’s clear that imitating authentic emotional laughter is a valuable deceptive tool for social lubrication. One need only witness the contagious effects of canned laughter to see how true this is. In the complex reality of modern human social interaction, laughs are often aromatic blends of the full-bodied spontaneous and dark but smooth volitional types, further blurring the boundaries. Regardless, the goal is the same and we will most likely find ourselves becoming fonder of those we share the odd chuckle with. John Cleese once said: "Laughter connects you with people. It’s almost impossible to maintain any kind of distance or any sense of social hierarchy when you’re just howling with laughter." He might just have hit the nail on the head – even when we’re faking it. Jordan Raine, PhD Researcher, Nature and Function of Human Nonverbal Vocalisations , University of Sussex.